Gleason, 9 weeks old, 1st day home. I think most of you know Spanky (you can find him on Facebook under "Spanky Escobar") and recently I posted about our newest addtion to the pack, Gleason. Spanky and Gleason are getting to know each other and enjoy playtime (sometimes we believe a little too much... LOL). They are in their 2nd week and we are doing fine. Gleason is a little rascal for sure, always initiating play with Spanky. Spanky is such an angel, he lets him hang on him. Last night I felt that Spanky was getting a bit rough but I don't know if that's just Mommy's over protective nature. Their posturing confuses me sometimes, thinking its growling. Very vocal for the most part but just romping around. Tell me how your 2nd addtion into the pack went (or is going). I would love your feedback! Have always enjoyed reading about spanky but so nice to meet Gleason. They are both gorgeous and so glad they get along. When we decided to get a playmate for cotton we ended up getting a rescue from a puppy mill. We named her Candie and she had mega mega issues of trust and past history of abuse, it was terrible but cotton took to her right away. I think all the trust we have built up with candie is because of their close relationship. Cotton is the dominate one, even though candie outweighs her by 4 lbs. At times cotton gets a little rough, she is quite vocal when she plays and would scare her--however if I say anything--candie thinks she is being scolded and will run and hide. I have learned not to interfere. Once in a great while we will pick cotton up if she really gets excited but for the most part she is just great with her. There will be jealousy issues at times but Cotton has been the most loving sharing little girl we could hope for. We wish you the best with gleason but know you will do fine. We have not had any food issues other than Cotton is so slow in eating and very picky so I always have to feed her separate to be sure she gets enough. She has to drag her food all over the floor, onto a rug and sometimes lays it all around her plate, then starts to eat it. They will share treats -toys and everything. Candie has become such a sweetheart and never fights or growls at Cotton. Seems they have their own pecking order and it works for them. I think having two makes a big difference when we do have to leave them as they have each other and do not feel so lonely. Enjoy your new little fur ball-----sure is cute! Glad to hear that Spanky and Gleason are getting along. 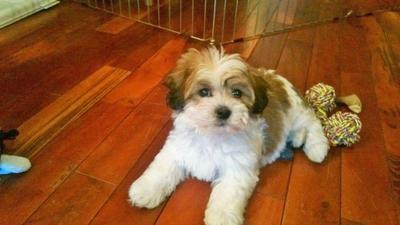 Based on our experience of bringing in a new adoptee to our family, Sandy the Havanese, the dogs will work it out. We did have a few issues. Sandy had been in the SPCA twice and had some survival behavior issues to address. Food dominance was the biggest issue as well as being a bully (she was only 13 pounds). With the help of the volunteer trainers at the SPCA we persevered and Sandy and Molly (the Coton) are best friends now (both girls). Sandy growls when she plays and I couldn't tell if she was being aggressive or playful. Molly is very sweet and gentle playful. Sometimes play gets very rough and I intervene, although they work it out and ignore me. But now when we have to take one to the vet or groomer, the other one looks depressed and sleeps. But when they are reunited there is a greeting between the two of them that is heart wrenching. They touch noses and rub heads and welcome the "missing" one back. Interesting behaviors. Out little girls really do well together but it took awhile (over 6 months) before there was this dog affection. Our dogs look very much alike and people think they're twins but our Molly is a lady and Sandy is the troublemaker. Both Spanky and Gleason are beautiful Cotons. I am sure they will work out their relationship. 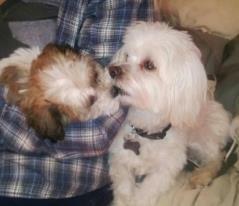 This was the first night that I let the older Coton play with the new puppies. I got the puppies on Sunday. The video was on Wednesday. Daisy wasn't sure at first, but after watching them for a couple of days, she decided that they might be fun. There is no growling in this video, but it is pretty common when they play -- rough house. The smaller puppy would (and still does) latch on and hang on Daisy's face hair. Daisy just lets her. Daisy is now 7 1/2 yrs and the "puppies" (Poppy & Tulip) are now 2 yrs old. Daisy is still the boss and will turn and let them know when she has had enough.